Have you ever tried Pink Himalayan salt? I am sure you have heard of it, maybe thought about trying it, and today is the day! Pink salt is a salt that is found in the Himalayan mountains in a range stretching across Asia through China, Nepal, Myanmar, Pakistan, Bhutan, Afghanistan, and India. The different hues of pink, red, and white are an indication of the salt’s rich and varying mineral and energy-rich iron content. Pink Himalayan crystal salt contains all of the 84 elements found in your body, just to name a few: sodium chloride, sulphate, calcium, potassium, and magnesium. So, why should I use this instead of my normal salt? Iodine- Natural salts, like pink salt, are rich in iodine. This means that it does not need to be artificially added in. Less sodium- Yes, I know, that sounds strange, but Himalayan salts are mineral packed crystals. They are formed naturally in the earth made up of 85.62% sodium chloride and 14.38% other trace minerals like sulphate, bicarbonate, bromide, and strontium. Balance the Ph (alkaline/acidity) and help acid reflux. Conventional table salt is completely stripped of a good majority of its minerals with the exception of sodium and chloride. It is bleached, cleaned with chemicals and then heated to an extremely high temperature. Then the iodine is added in that is almost always synthetic that is quite difficult for our bodies to take in. Many studies have shown that for each gram of table salt consumed the body cannot process, your body will use 20 times the amount of cellular water to neutralize the amount of sodium chloride that is presented. Versatility! That’s right, it can be used for more than just its food seasoning properties. Air Purifier- crystal rock lamps make wonderful air-purifiers! 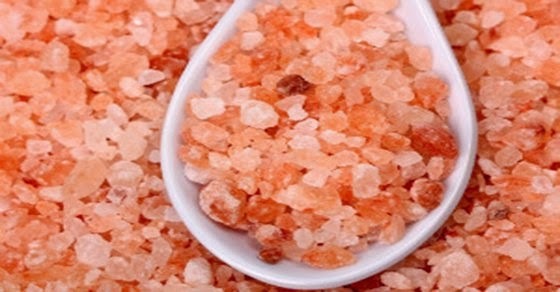 Bathing- throw a handful into the bath tub for a detoxifying Himalayan salt bath. The replenishing nutrients help to stimulate circulation and soothe sore muscles. Decoration- they make lovely food decoration; you can also buy salt slabs to present your food on as well as lamps and holders! Believe me, once you make this investment you will never go back! Don't Ignore SHARE this !